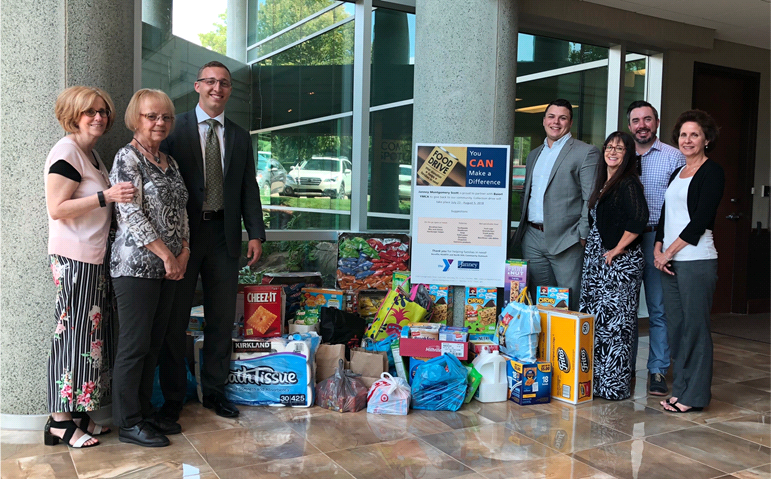 From L to R: Mike Callas, Rich Reynolds, Mary Gordon, Cindy Stiller, Peggy Herman and CJ Testarella at the Wexford Office food drive. From L to R: Rich Reynolds, Mike Callas and Rob Gleyze after winning first place at the Janney & the Y Triathlon on August 5. While Wexford may have been a new market for Janney at the time, the nearly 20 Financial Advisors and support staff in the office had deep roots in the local community. 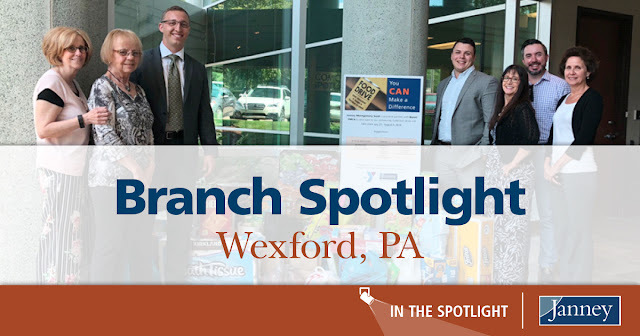 Today, much of Janney’s name recognition in the Wexford region comes from the office’s active engagement in the community through volunteering, fundraising and memberships on the boards of local organizations. One example is the office’s support of the local YMCA. For more than 10 years, the office has been the primary sponsor of the Baierl YMCA’s triathlon and several Janney team members have participated as part of a team or as individual participants. 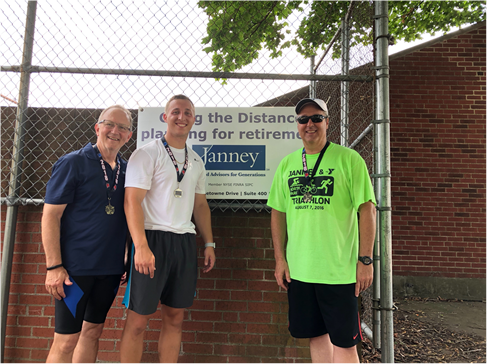 During this year’s event, which took place on August 5, the G & R Wealth Management Group of Janney’s Wexford office won first place in the Corporate Team division. Rich Reynolds swam, Rob Gleyze rode his bike and Mike Callas ran to complete the three part race. 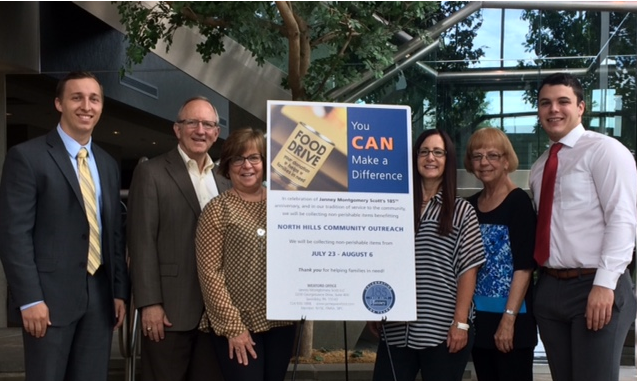 From L to R: Mary Jo Keeney, Peggy Herman, Mike Callas, CJ Testarella, Cindy Stiller, Joe Kennedy, and Barb Ujazdowski at The Wexford office’s 2018 food and toiletry drive benefiting North Hills Community Outreach and HEARTH. Members of Janney’s Wexford office have a long history of giving back to the community. Bob Herman, who served as the Branch Office Manager before Richard, spent 30 years as a volunteer coach and official in the Chartiers Valley School District Elementary Program. Jerry Starr, Financial Advisor, served for many years on the Board of Trustees for the DePaul School for Hearing and Speech, where he continues to support their charitable mission. Doug Stirling, a Financial Advisor with The Stirling Group, serves on the board of the Pittsburgh Zoo and PPG Aquarium. The Stirling Group even invites clients and their families to an annual client appreciation event at the zoo each year. “Everyone in the office had a community-minded focus before Janney, but the firm really embraces giving back and has done so consistently throughout its history,” Rich said. Rich also embraces his innate entrepreneurial spirit in the way manages the Wexford office and interacts with clients. Before he entered the financial services industry, he served several years in the Navy before owning and operating a printing business. His experience as a small business owner served him well as a Financial Advisor and Manager and he’s found that the Janney culture has not only allowed him to be entrepreneurial, but has encouraged him to embrace that side of himself.